I'm pretty shy. Okay, I can be close to mute at times - just ask some of my best friends. I didn't utter much more than a couple words to them for months when we first met. It doesn't mean I don't have anything to say, obviously I do - I have a blog for goodness sake! It's just that when I first meet people, or when I'm in groups of more than 3-4, I go into my own little shell until I'm really comfortable and then you can't get me to shut up. Without doing a whole psychoanalysis thing, it's probably a major reason why I like to write. I get to be my true self, without inhibitions and the anxiety I get from meeting people face-to-face is nonexistent. It's just me and my computer, until I hit post. Then I open myself up to a whole new world of critics. The anonymous readers that pop up all over my google analytics map telling me they're reading their way through my recipes, across to my blog to my about page and scurrying through several years of posts. They're in Winnipeg and Washington, Singapore and San Antonio, all places I've never been. I should be terrified. My anxiety should be through the roof. I mean essentially these are strangers reading some of my deepest thoughts. But I'm not, and I certainly don't consider you strangers. I find this little space comforting, and I've loved getting to meet so many of you through comments, emails, pictures and your own blogs. I feel like I have a network of friends that I've never met. Ladies that are encouraging and prayerful, sarcastic and witty. People I can lean on for advice about parenting, blogging, the workplace and marriage. 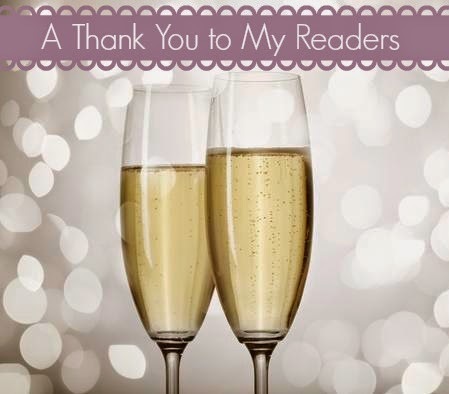 So this is my thank you to all my readers. To those of you who are new, stick around awhile. I hope you like what you read. If you want to know more, this should do the trick. If you don't like it here I understand - I'm not everyone's flavor. But for those of you who keep coming back and reading, I want to thank you from the bottom of my heart. You make this fun for me. I love getting to know you and I feel like we're friends. I don't say thank you often enough so please know that I sincerely mean it when I do. This one's for you! Cheers and Happy Friday! Hi Libby, thanks so much for stopping by and leaving a comment. I am now you're newest Bloglovin' Follower! It's wonderful having such a supportive community of women out there, like yourself, that challenge us to open up and climb out of our shell. This is why blogging is so great. It gives us all a voice to say the things we can't say out loud. It's awesome that you feel this way. I couldn't agree more! Thanks so much Ashten have a great weekend! I love this! I read a few blogs, and I think it's so wonderful when bloggers take a moment to acknowledge their readers like you did here <3 Plus, I love seeing my hometown named!! Alysa, thank you so much for the comment, you're so sweet and you made me smile! I really appreciate that you keep coming back to read Everyday Thoughts. If you ever have any questions or comments please know you can always reach out.